Marketing over the years has become an increasingly scientific discipline with highly refined methods and tools available. Far too many of them. So, while until recently, not having access to quality information was the biggest challenge, ironically today, marketers and business people alike are suffering from information overload. Content marketing and inbound marketing are classic examples of this phenomenon. It’s easy to find millions of articles on how to market using content for virtually every step of the buyer’s journey. The trouble, however, is most of these pieces of advice floating online usually tend to be unproven, disjointed, contradictory or downright false. Since testing and refining strategies can be very costly, any entrepreneur has to ask – where can I look for practical, workable information? While there are plenty of high-quality sources to learn content marketing, one of the better options are online coursewares. Many reputed brands offer complete end-to-end marketing courses that educate the reader on all aspects of marketing. Hubspot, one of the best providers of marketing automation technology has just such a free marketing course that details every step of inbound marketing. While you should consider taking the course, here are 5 key takeaways from it if you’re strapped for time. The starting point of your inbound marketing strategy is building buyer personas, which are essentially a semi-fictional representation of who your ideal customers are. A persona should include real data such as your audience’s pain points, where they hang out, what resources they use and what their goals are. Having your personas in mind will help you not only create richer content but also distribute it on relevant social media and then better analyze your results. Customer interviews: Your existing audience is the best place to find information relevant to your marketing activities. Sales Data: Your sales team will have invaluable first-hand information on what your customers want, and who they are. Social Media Profiles: Social media is a powerful tool for not only connecting with people but understanding them as well. For instance, the “Insights” feature in your Facebook business page can give you a lot of important information on who most of your audience is, what content is best performing and how you can perform better. Here’s a complete guide on how to create a buyer persona, complete with a step by step breakdown of every step. The internet is filled with company blogs that generate little business and just sit there, looking pretty. To make sure this doesn’t happen to you, you need a documented strategy before you’ve even written the first article. What do your buyer personas need help with? What are industry bloggers, social media, and your competitors talking about? You can promote offers and ask people to sign up for your email list to know more about your product/service on your blog post, too. Here are the 10 Blog Post Commandments, in case you are looking for some of Contentools’ best practices. Until fairly recently, marketing tried to reach out and push a company’s messages onto its audience through interruptive methods like print ads, TV commercials, cold calls and unsolicited junk mail. However, with the latest technologies, those methods have not only become ineffective, but expensive, too. Inbound marketing turns this idea on its head as it works towards attracting the right people rather than stalk them online. This is where you will need to have your buyer persona in mind and make sure every piece of content you create has a clear purpose. Instead of publishing articles that you think are important, use the personas to come up with ideas for content that are relevant to the audience. Every time you create a blog post, email, whitepaper or ebook, make doubly sure that it is something that most of your audience is going to find useful. Chances are a few pieces of content will perform exceptionally well; those will be the ones to place your bets on! 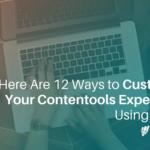 If you are looking for a way to better choose between types of content for each of your intents, check out The Content Marketing Matrix, an interactive tool, powered by Hubspot and Contentools, that will help you be more assertive! At this point, it’s a foregone conclusion that you need to be on social media. However, social media marketing is a science in itself. It’s all too common to see businesses treat social media as just another sales channel and plaster their accounts with marketing messages. Social media is best thought of as a gathering of family and friends rather than a tradeshow. It’s a great place to network and to get to know people, which is why it also fits inbound marketing like a glove. Social monitoring covers the research part of the equation and can be used to discover content ideas, frame a buyer persona or even get feedback. If your company is on multiple social media websites, tools such as Hubspot and HootSuite provides the ability to set up streams from all your social media channels on one screen. Social publishing includes everything about posting content to your social media channels. Start by creating an awesome profile that tells people how you can help them. A company style guide can be created to make sure everyone follows a universal posting format. And in case you are looking for other ways of distributing your content, check out 4 Ways to Leverage Your Content Without Paid Media. Every time you make a guess, there’s a chance it won’t work which means lost dollars. By constantly analyzing everything you’re doing, the chances of failure drop significantly because (1) you can make decisions based on real data and (2) you can recalculate your route according to the outcomes you get. Furthermore, it’s crucial that you understand how people interacted with your content and whether their actions were in line with your business goals. So, by analyzing your results, you will be making sure that your ends meet. Take inventory of your competitor’s content. Make a list of all their blog posts, white papers and ebooks to find out what content is most repeated. Understand the quality and quantity of content that they are offering. How is it all performing? Analyze content topics. Which content is the most commented on or shared? It’s so easy to think that your job is over once a customer has been secured. As a result, many patrons end up feeling ignored and unappreciated. To make sure that you remain in good stead with your existing patrons, consider following the three pillars of customer delight: innovation, communication, and education. Innovation doesn’t necessarily refer to new products. Anything you can do to make sure your customers have a better experience is considered innovation, whether it be enjoying a new feature or reading a helpful guide with useful hacks. Finally, education here means empowering people with the knowledge they need to make their lives better. This, in a nutshell, is the purpose of content marketing and should be the primary motivator behind your efforts here. While content marketing is an evolving field, the fundamentals have always remained the same. Everyone in your organization should be committed to making sure your customers and audiences are treated to the best experience possible. The latest marketing techniques that come along only make this easier, they don’t change the goal. Parth is a freelance writer and certified content marketing specialist. He loves writing about technology, renewable energy, fitness, and marketing. A value driven marketing evangelist, he has a knack for finding unique and unconventional ways to connect brands with their audiences using entertaining, informative content. Find out more about him at his website – Quill Canvas. What Kind of Agency Should You Build?